Just wonderful!! Never would I think mellow would apply to Laphroaig, but to me it does to this expression. The nose is honey, mossy and peaty, with some light (as yet unidentifiable) undertones. The palate is smooth and creamy, snd in a way, similar to Highland Park 12. Noticed lots of caramel, chocolate and sweetness. Very sweet, in fact, for a Laphroaig. Not the overwhelming peat and smoke bombs of other Laphroaig expressions. There were some distinct floral nuances here as well. Overall, it seemed leathery and creamy, more than smoky. The aftertaste is long and lingering, with smoke and peat, but primarily leather and meat left on the throat. Just absolutely delicious!! @mhock66, nice review, thanks for sharing. I am a big fan of Laphroaig 18. Over the past year I've enjoyed this one with friends and wish I could replace it. The green tube release is not easily found and expensive when it is found. Time has been kind to Laphroaig 18 YO. I have read recently, probably on this web site, that this expression of Laphroaig is to be discontinued, I hope not. There must be a market for it, although if enough NAS bottlings are selling at similar prices why bother maintaining age statement expressions? Enough pontificating, the whisky is blonde in colour with an emphatic nose full of peat smoke, lightly smoked haddock, some hints of bitter black coffee, cocoa, and given time all sorts of aromas waft in and out of the peat, from vanilla, cinnamon, raisons, some herbal notes and aniseed. On the palate there is a wonderful juicy full bodied sweetness to this malt which really contrasts and compliments the rich peat smoke, peat and sea salt. Swirl it in the glass and start to delve further and cocoa, malt, seaweed, some spicy notes and something fruity that I can’t put a name have appeared to me over a number of tastings. The finish is heralded by some nuts (almonds and pecans) which welcome in more bitter flavours of chocolate, coffee, but the main theme remains spade fulls of peat smoke and sea salt which fade drying all the while. One of my favourites. I have 2 bunkered and would grab some more before it's gone, but the price is getting pretty stiff where I live. It's kind of Laphroaig's equivalent to Bowmore's Laimrig, ie one of their very best and most accessible expressions. Most credible reviewers put this in the 90s. Thanks for the excellent review. I take laffiness in this context to mean the medicinal phenolic character(?). The 18y is certainly smoother than younger expressions I've tried, but there are compensations in the flavour development. The 1/4 cask is my preferred Laffy, smoother than the 10 and cheaper than the 18. Laphroaig distillery (the name means "the beautiful hollow by the broad bay") was established in 1815, by Alex and Donald Johnston. It was sold to Long John International in the 1960ies and subsequently became part of Allied Domecq. Today the distillery is owned by Beam Suntory, the American subsidiary of Japan's Suntory Holdings. The 18-year old was first released in 2009 to replace the former 15-year old expression. In September 2015, Beam Suntory confirmed that the 18-year old expression would be discontinued once current retail stocks will have been depleted. The nose is a bit austere to start with: ashy smoke (very delicate), sawdust and cereal flavours are there first. Next, fruity notes develop, such as vanilla, honey and lemons. There is also very subtle brine, together with notes of soot. The palate is medium-bodied and rather smooth, not to say mellow. Salty and smoky flavours mingle with notes of vanilla and pineapple, black tea and seaweed. Clearly, this is a gentleman’s dram. The finish is long, warming and dry. There now is a bigger influence from wood spice than before. The salt and seaweed flavours are back, together with soft smoke in the background. The 18-year old was one of the very first Laphroaig expressions that I tried and for me it has always stood for the more grown-up older brother when compared with its wilder 10-year old sibling. I am still a fan of the combination of mellow fruitiness with those ashy and sooty notes. It will be sad to see this gone and one can only hope that Laphroaig will come up with a suitable replacement. Nice review and very well described - I am quite partial to this release myself. I am mildly disappointed to learn that the plan is to phase this out and am looking to stockpile a few more bottles before it finally happens. As it is, stock of this is starting to evaporate. Hi @sengjc, thank you for your kind words. Yes, a huge disappointment that this is going to be phased out. Although I am more a fan of the 'slap-in-your-face' expressions such as the 10yo CS I kept returning to the 18yo time and again. Prices have been going up for a few months now and I made sure to add some spare bottles to my cabinet. My air conditioning unit broke down, and it's a bajillion degrees out there. What's a boy to do? Drink Laphroaig 18, of course. The colour is a bright gold. On the nose the smoke is perfectly integrated with the sweet caramel. Wet campfire, smoked cheddar (I'm not kidding) and green apples. Fruity and also floral. Water adds some maltiness, with cereal notes. Elegant yet powerful. On the palate it's even fruitier with poached pear, lemon and more green apples. Chili spices. Unassuming peat - less smoky than the nose. Ginger. Spicier with water - wow! Mouthwatering. Delicious. The finish is mouth-watering with cereal, black liquorice and soot. That big, phenolic, smoke powerhouse that we know and love of Laphroaig has taken a slight - very slight - backseat to an elegant maltiness; the peat has been nicely smoothed down by the oak. Yet still unmistakably Laphroaig - and is perhaps my favourite expression from them. A month ago, Rick Culver came by to do a big Ardbeg night. But then we did some other Islays, and he had also brought a bottle of Laphroaig 18 that, if memory serves, was already open. We had a dram of that, and then I poured off a sample bottle. A month later, I tasted it again and wrote this review. I know I am very bad at revealing how long my bottles have been open when I write these reviews, I just forget to give that information. In any case, whether it's freshly opened or not - this is one damn fine scotch. Yep, no whisky is better when it sizzles outside than Laphroaig. Laphroaig 18 is a great whisky, all right. Two questions: 1) is this from a full bottle?, and, 2) if so, how long has the bottle been open? Less smokey and peaty then most Laphroaig's. Seems a bit more sophisticated and complex, but not by being more floral or fruity. You find yourself waiting for whatever comes next, but it plays hard to get and takes its time to develop. I recommend this one from a scotch glass, I feel I get less from the nose, but more from everything else it has to offer. Balance-24: smooth, sweet and smokey, long and complex. Balance-23: Wood notes carries the theme. I’m not too familiar with older Laphroaigs. Before buying this bottle, the oldest Laphroaig I’d had was a 16 year old OB, and that was ages ago. My familiarity with this brand comes mostly from my consistent love affair with the 10 year old and my on-again/off-again relationship with the QC. But 18 sounds like a good number. I like this one fair amount of water. Here we go. Nose: Classic Laphroaig peat, grass, nougat, toffee, and chocolate-caramel. Slightly fruity too, with plums, apples, pears, lemon zest, and unsweetened orange juice. Palate: Ballsy stuff. Heavy, dark peat, asphalt, camphor, medicine cabinets… you get the idea. Followed by a bitter lemon rind, loads of brine, oak, and licorice. Finish: The peat is still huge. Strong licorice/anise note here, chocolate, honey, wet wood, brine, candied apple, unsweetened orange juice, and camphor, underpinned by some sherry notes. I didn’t care for this much when I first popped it. I didn’t find it balanced. But it’s been open for over four months at the time of this review and it’s improved quite a bit. The peat and sherry flavours are better integrated now. It’s heavier than I would have expected for an 18 year old, but then again Laphroaig always goes big. Overall this is nice, but I don’t consider it much better than the 10, which is half the price. Also, I think better casks could have been used. Good, though. Great review, as usual. Excellent suggestions and observations. Well done! Correction. The 16 yr old I tried was an IB, not an OB. I'm ashamed to admit that I am a bit of a Laphroaig snob due to having owned the 2012, 2013 and now the 2014 Cairdeases, in addition to the 003 and the 006 Cask Strength 10 years. In light of these past wonders of High Scotchcraft, the 18 year didn't blow me away; but it was a welcome dram to cup on a chilly late summer's eve. Aye, it's still a great scotch, well above the benchmark of "acceptable," especially for those who can't get their hands on a really unique Laphroaig offering. I was grateful to find the 18 Year at a pub near my home. The peat comes through in scintillating layers, and the trade marked seaweed (iodine) is dialed up to just the right level. Lovely nose, to be sure. A fulsome palate that delights and "brightens the corners," so to speak. I also detected lemon rind on the finish due to more time in the casks. 48% goes down the hatch smooth as butter. A very creamy delightful dram, indeed, and well balanced, even if it's not the most complex or dazzling Laphroaig in existence. The sophisticated class of the 18 more than makes up for a lack of bombast in one's glass. As for a long list of metaphors and allusions to other things in typical tasting note form, I just can't muster up the energy to "go there" tonight. I lived in New York's Manhattos for many years so 9/11 takes a lot out of me. I've researched the topic ad nauseum and the official story, as well as the 9/11 Commission's findings, are insulting to my intelligence, as well as to every other American's. Those who died on 9/11 deserve so much more than to be sacrificed for a war machine that needed yet more excuses to spend, spend, spend. Drinking a glass of Laphroaig 18 went a long way towards soothing my nerves tonight. This review is dedicated to all who died on 9/11 and to those stalwart firemen, police officers, and so many other brave men and women who died years after their heroic efforts on 9/11 from exposure to thermite dust and other strange ungodly stuff that was absorbed into their bloodstreams due to whatever evil machinations brought down the twin towers. As for box cutters defeating the shield of NORAD's might, fie on that lie being promulgated by hidden evil in high places; fie on the myriad minions in media & the scientific dictatorship that dance like marionettes from gilded golden purse strings, moving wooden lips in time to their puppet masters' machinations. Praise be to the waters of life. There's nothing like a fine glass of scotch to toast the brave and the fearless who sacrificed so very much. As Robert Burns wrote in one of his most famous poems: "Ye see yon birkie ca'd a lord wha struts, an' stares, an' a' that tho' hundreds worship at his word he's but a coof for a' that for a' that, an' a' that his ribband, star, an' a' that the man o' independent mind he looks an' laughs at a' thatA prince can mak a belted knight, a marquise, duke, an' a' that; But an honest man's aboon his might, gude faith, he maunna fa' that! For a' that, an' a' that, their dignities an' a' that, the pith o' sense, an' pride o' worth, are higher rank than a' that." Warm gentle herbal sweet arrival develops a long smoky syrupy sweet vegetal smooth finish. This is by far my favorite single-malt thus far. An absolutely wonderful dram that reminds me of huddling near an autumn camp fire, fueling up at a gas station in the small hours of the morning, and enjoying a tasty cigar to celebrate an expected baby. In other words, all the best moments in life. I love the smoothness of it. The lower alcohol level really helps all those beautiful flavors and scents come through. Laphraoig is like a cultured, winsome lady - sultry and seductive but in a low-key, nuanced way. Not for those on whom gentle subtlety is lost. This was another one that I sampled at the bar for the first time and wound up being those rare one out of three chances that justified buying a bottle to bring home. This now brings the Islays in my collection to four. As most of my readers of my numerous posts already know, I am absolutely terrible at doing tasting notes because I am not a magician who can pull flavors out of thin air that do not exist. What I am very good at is comparing samples side by side, which probably is an extension of my days as a music writer. This one is subdued peat with a taste of sweet oak. Initially, I figured that my Caol Ila 12 would be a good basis for comparison. Well not really! The Caol Ila is pale straw in color and is a peat monster. This Laphroaig 18 is golden with the peat having been slowly tamed into submission. Still wanting to compare to my darkest Islay, I poured a Glencairn with my Bowmore 15. Again, no comparison, since the Bowmore is much richer and darker. However, the Bowmore comparison did allow the Laphroaig to show just a bit more of it's peat characteristics. 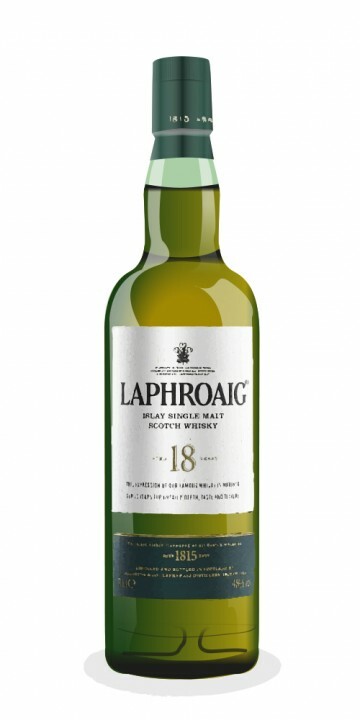 In a nutshell, Laphroaig 18 is an all around balanced winner and in a class by itself that I will keep buying, especially at the US price of $63. This one is a no brainer! Damn fine whiskey! Bye bye blends! I can get this bottle for 96$US at the moment - I normally don't pay this much for a scotch I've never tasted before, but as I love the Caol Ila 18, Ardbeg 10 and Laphr'10 I assume it is worth it, based on everybody's comments & reviews..? The Bowmore just has coloring in it. It's not really much darker without the fake coloring. Good to hear you like the 18. well done! Palate: oak charr nuts,bit honey, unindentified organic peat organisms, drygrass, green pepper balls. You get sucked into a taste adventure of the highest order, the 18years really shine on the palate:) It slowly builds its flavors and it gets sweet and then it gets bitter, then salt and creamy and back to sweet and a bit sour again; all within 30 seconds in the mouth. There is so much going on that I feel too inexperienced to write something useful about this really. This has nothing to do with the 10yo or the quarter cask, its a totally different animal. The finish is long with a nice soft glow, woodsugars, smoke, ash, dry peat, barleynotes and finally some iodine pops up. Im halfway the bottle now after 3 months and it only got better over time. Its like the best Laphroaig that would be hard to recognize as a Laphroaig if it were sampled in a blind Islay test. Dark, stormy, strong, but also delicate and gentle. Mythical stuff, liquid sunrays. Well said @PeatyZealot This is great stuff, and as you say, in a far different league than the QC or the 10, both of which I also love. The 18, though, is just a different animal, much more oily and complex. Nice review, thanks. Matured in a combination of bourbon and sherry casks this is a lovely maturation. Beautifully balanced between sweetness and that iconic Laphroaig signature. Nose: Laphroaig signature medicinal, seaweed, tar and peat, but loads of complexity, a lot of floral notes, treacle toffee and bitter chocolate also black pepper and dare I say Christmas cake and dried fruit. With Water: signature dominates, much saltier, toffee still there, chocolate as well, touch of fruit. After 15 minutes it completely changes, massive rose – floral note dominates everything, so strange to think im drinking Laphroaig. Pallet: Rich arrival, sweet development with caramel, toffee, then peat comes through although not with the usual Laphroaig style hammer, it’s quite restrained in its delivery, it’s a little bit oily, some smoke also some bacon and mortadella (Italian cured meat similar to luncheon). With Water: peat first up also chili, then progressing into more subtle fruit and floral flavours touch of citrus on the mid pallet. It's taken me a long long time to get my head around this whisky, im not sure what it was but i just didnt quite understand it somehow. Now i believe i do, i just wish it didn't have caramel added to it. However, it is a great whisky, perfect Islay for me. very complex hints of floral, smoke and peppers. finish: long lingering pepper and smoke 10-15 minutes after the first swallow. i'm so glad i purchased this bottle of laproaig. i wanted something different from my sherry cask finished aberlour 16 and aberfeldy 21. this hit the spot. this was matured in oak and you can taste the oak woodyness (sp?). i know some notice a medicinal smell but i do not. which is good because i don't like to drink medicine. the nose i think is the only weak point because it dissipates so quickly. the legs are slow, thick and consistent. the color is golden heather. the taste is so smooth with smoke and peppers. the finish lingers in your mouth and tongue. i like it. i enjoy this bottle without water but if you do add water no more than 1 drop or 2 please. @Victor - I bought this on your recommendation and was indeed not dissapointed. What a beautifully un-doctored, pure, crisp Laffy. Sweet brine & subtle oily peat at it's best. @Jules, I wonder the same thing about Laphroaig and the wood finishes. Fortunately there are plenty of good straightforward standard house style expressions of Laphroaig available. On the whole I would say that I consider Laphroaig to have the most consistency of high quality of product among all of the Scottish distilleries. I've never tasted a bad Laphroaig. Just wonderful!! Never would I think mellow would apply to Laphroaig, but it does to this expression. The nose is honey, mossy and peaty, with some light (as yet unidentifiable) undertones. The palate is smooth and creamy, to me similar to Highland Park. Noticed lots of caramel, chocolate and sweetness. Very sweet, in fact, for a Laphroaig. Not the overwhelming peat and smoke bombs of other Laphroaig expressions. There were some distinct floral nuances here as well. Overall, it seemed leathery and creamy, more than smoky. The aftertaste is long and lingering, with smoke and peat, but primarily leather and meat left on the throat. Just absolutely delicious!! Nice review, and right on the money :) Love the 18 yo myself! Laphroaig smells like insulin... Too adulterated for my taste and olfactory senses. What a revelation this one's turned out to be! A beautiful nose full of glorious peat, sea salt and a touch of smoldering hay. There's a faint touch of something sweet as well. The palate comes roaring to life thanks to a generous 48% ABV bringing with it a strong dose of iodine, smoky oak and pieces of dry husk. The spices dance playfully towards the end but are masterfully subdued by a touch of licorice. This can easily become one of my favorites. In 2009 the new 18 Year Old hit the shelves, replacing the popular 15 Year Old. It is bottled at an ABV of 48%, similar to the Quarter Cask (while the 15 Year Old was bottled at 43%). Color-wise, they are nearly identical. The nose is clean and very smoky with dry peat and moss. It reminds me of a walk in the forrest after a rain shower. Quite a bit of honey and vanilla sweetness, nicely balanced againt citrus and brine. The whole is much softer than the 15 Year Old, though. The extra years in the cask have mellowed the whisky somewhat. On the palate, however, this is a sturdy fellow. Quite the body, indeed! Creamy. The vanilla and honey are easily overpowered by the classic Laphroaig traits: charcoal, tar, dying barbecue and seaweed. Cereal and burning wood. A mix of peppers. Quite a bit of salt. Delicious. The finish is lingering and bittersweet, but again somewhat reserved, as if this Laffie will only dares show its true potential on the palate. It's hard to say whether I prefer this one to its predecessor. The higher alcohol content and the fact that this one is non-chillfiltered are big plusses, as I'm sure many will agree. @markjedi1 I was pondering whether or not to purchase this or not and on the strength of this review I think I will. I recently "re-discovered" my bottle of ten year old which had been lurking at the back of the cupboard and forgotton just how nice it is with a tiny drop of water. I quite like the idea of a slightly mellowed laphroaig. P.S. I'm a newbie to whisky connosr, hello. In the sunlight, the 18 is reminiscent of liquid topaz – a brilliant yellow-gold; on the glass, it is the colour of honeycomb and captured sunlight. Medium body (though I found this to be the slightest bit lighter than the 15) with the legs to prove it! There is a sweet aroma – like honeysuckle – the start. A lot of the sea in this one as well; I have a rush of seaweed, brine and fish oil, followed by wet clothes after a drenching rain. The smoke is there – a campfire smouldering from the night before. This is a robust dram. The sea doesn’t end with the nose in this one, and a dry iodine and saltiness are countered by a pleasing sweetness that suggests toasted grains and simple syrup. The peat and smoke is there throughout, but reveals itself most prominently at the middle and on the finish. The additional 5% alcohol in the 18 Year Old (as compared to its predecessor, the 15 Year Old) is noticeable, although this is not necessarily a bad thing. The peat is prevalent, and is most akin to campfire ash or charcoal soot – perhaps not too appealing when reading about it, but delicious when imbibing. Additionally, and moreso than the 15 Year Old, the 18 lasts in the mouth – it has been a good 5 minutes, and the flavours continue to play on my palette, with the peat giving way to a pleasant sweetness reminiscent of apples and toffee. Truth be told, I am a dirty old man who likes my 15 Year Old and would have been very happy if Laphroaig had left well enough alone. That being said, having completed a side-by-side tasting, I must begrudgingly admit that the 18 Year old has its merits and is a thoroughly enjoyable dram. Is it a worthy addition to Laphroaig? Yes, definitely; Is it a worthwhile replacement for the 15? I cannot agree...the 15 remains a favourite, and will likely remain so until my last pour – but it is nice to know that there is a place on my shelf for her older, bolder, and more flirtatious sister. Thanks whiskyshiba. Please share your own thoughts when you do. As for the 10 Year Old Cask Strength...well, I am going from memory, but as I recall it is more energetic, and has more zest and and considerably more heat. The 'medicinal' qualities are more pronounced, as is the peat (which I recall being quite impressive). But really, what I remember most was the power...compared with the 10, the 18 is moderation itself. I think that is one of the benefits of the 18; you can enjoy much of the vibrancy of the 10 Cask Strength with the tempered exuberance and smoothness that comes with a bit of age. @Spiritsafe, Nice review! I've yet to try the Laphroaig 18. I will add it to my shopping list. Also, how is it compared to the 10YR Cask Strength? I can understand why those who coveted the 15 Year were a little disappointed by this. It's age reflects youth rather than refinement. Granted, it's not as powerful as it's youngest brothers, but it still packs a punch. This reminds me of the 10 Year CS with a little less edge. The QC is sweeter and the 15 Year is more refined. I like this, but as it is close enough to the 10 Year CS and somewhat to the Quarter Cask, I will stick to one of those as my Laphroaig staple (and the subtle hints of Islay finesse, I will leave to Ardbeg). My wife and I recently went gallivanting up and down the east coast of Australia visiting Sydney, Brisbane and Melbourne. The main reason for Melbourne was shopping, and the main reason we decided to shop there was because of Nick's Wine Store in Armadale (a fairly wealthy inner city suburb of Melbourne). Whilst there I tasted a few drams (it's the only store I know that allows tasting of single malts, not just upon request, but they will actually offer them to you! ), and ordered three bottles. They finally arrived today, and this evening I cracked open the first of them, the Laphroaig 18 year old! The colour is quite pale for a whisky of its age, so it almost certainly has had no caramel added for colouring, and it states it has not been chill-filtered. Combine that with being bottled at 48%, I think even Ralfy would be relatively happy. The liquid looks very pale but is very viscous with long legs forming whenever you give the whisky a swirl. The nose is typical Islay strong, but very smooth, and, almost paradoxically, very lively - especially for an Islay. Lot's of dry smoke and peat mix with a briny sea salt to form a lovely platform for gentle toffee, honey, freshly cut hay and a touch of chocolate. This is a complex and mature, but seriously well balanced nose. I sat here taking it in for nearly 16 minutes before doing anything else. The taste immediately starts with a smoky, fruity tang that quickly expands with oak and nuts, before being swept up in a wave of gentle peat, vanilla, honey and brine. Further sips reveal roasted cereals and a hint of old leather. Every taste is slightly different, with new subtle hints coming throughand fantastic! The finish is long and smoky. It's powerful enough to leave your tongue feeling numb. It's full of honey and oak underlined by soft, dry smoky peat. Goes on forever - if you take a sip more often than once every 10-15 minutes then you aren't letting this dram show you its full repertoire. This dram somehow manages to be both genteel and muscular. This is a huge step up from the 10 year old which I personally find a little bland. Even the quarter-cask, which I think is an excellent dram, shows it's youthful simplicity compared to this. When I bought this, the gentleman behind the counter said that in his opinion this was probably the best single malt to come out in the past 18 months. He's not wrong! And at AU$150 (which means it's probably around £60 or so in the UK), for an upper range malt, this is excellent value. I'm not ready to give it a 10, but it is a high 9.5, up there with the Ardbeg Uigedail for me. I completely agree with this review. I recently uncorked mine and am waiting to taste it a few more times before I review it. My impression, so far, is this is a truly great whisky; even more so when you consider its modest price. Not as good as a Quarter Cask.